Sharing stories of the West Woodland Neighborhood located in Seattle, WA. 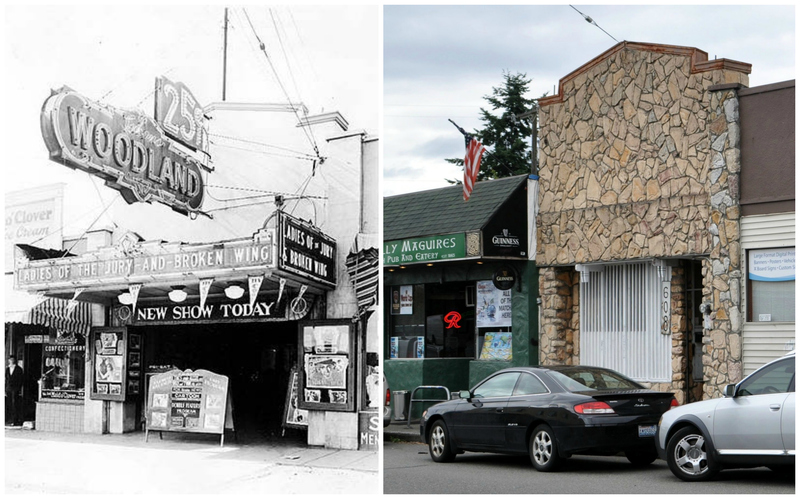 The Woodland Theater, built in 1926, was one of the last silent movie theaters built in Seattle. “Talkies” were already growing in popularity and by the 1930’s many theaters in the US were showing movies that no longer needed subtitles or a house organ for entertainment. When this 600 seat theater was built a Kimball Pipe Organ was also installed. The organ was the “special effects” for the Woodland Theater and provided accompaniment during the movies and concerts between showings. While shops have come and gone along NW 65th and buildings have been razed, the old Woodland Theater continues to live on. The theater building is currently in use as a concert venue called The Josephine, and as a print shop, storage & practice space. The old Kimball pipe organ continues to live on as well and is currently in use at the Everett Theater (2911 Colby Ave, Everett). When comparing the two photos, you can see that the entrance façade has undergone several cosmetic changes. The “Now” photos shows a stone façade that was added in the mid 1950’s. The entrance was closed in at a later date, but the roof line has stayed the same. In the wide view “Now” photo, you can see that the theater seating area, or the “house”, is behind a row of store fronts which have all been converted into one business, Advanced Sign Design. There were two movies showing the day the “Then” photo was taken in 1932, Ladies of the Jury and Broken Wing. The “Then” photo also shows a confectionery to the west of the theater, which is now home to Molly Maguire’s. The Woodland Theater has survived on NW 65th now for 84 years. During this time the building has been used as a movie theater, an indoor ski park, a medical device maker, print shop and concert venue. The building survived water damage in the 1960’s and a fire in the 1970’s. More on these events in a later post. 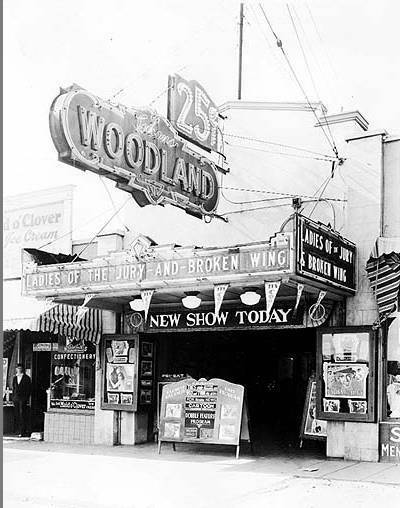 The black & white photo of the Woodland Theater, circa 1926, courtesy Cinema Treasures. This entry was posted in Neighborhood History, theater and tagged ballard, Neighborhood History, Seattle, theater, west woodland by West Woodland, Ballard. Bookmark the permalink. Thanks so much for these great stories! Don’t forget to tag your posts “Seattle” so that more people will see them, in the Seattle blog category. Good point! I need to go back through and add that, thank you for the reminder. You could also use the tag “neighborhood history” as there is a category for that on WordPress. I enjoy reading the posts from some other cities in that category.